What is Israeli cuisine? 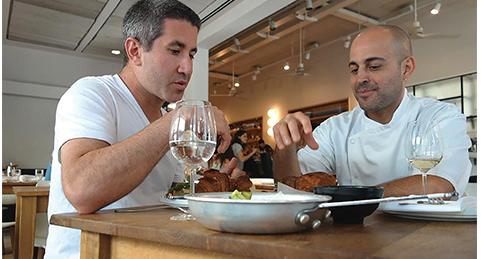 Chef, restaurateur, and James Beard Foundation Award winner Michael Solomonov travels through his native Israel to find out. Along the way, he visits fine restaurants and home kitchens, wineries, and cheese makers, to get a taste of the 70+ cultures that make up his homeland. A unique portrait of Israel and its people, all told through food. Followed by a conversation and nosh with Director Roger Sherman and Chef Michael Solomonov moderated by food journalist Corby Kummer. Special dinner package also includes pre-film kosher dinner, cookbook, and demonstration by Chef Solomonov. Dinner tickets valid at 6:00 PM. Film & Nosh tickets valid at 7:30 PM.